Last month I had to spend a week in the Silicon Valley on business. I took the opportunity to spend the preceding weekend in Oakland and check out the growing beer scene there. It's a good way to have a cheap Bay Area getaway -- I pricelined a hotel right downtown for $42 a night -- and San Francisco is just a $6 round-trip away on BART. 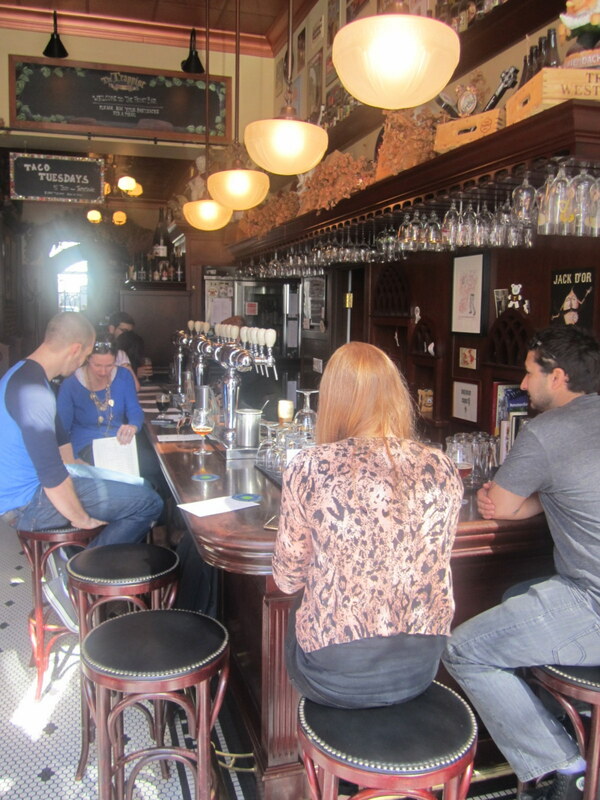 My first stop was a couple of blocks from the hotel, a Belgian-heavy place called The Trappist. A cozy, narrow space that they call The Front Bar calls to mind Dutch or Belgian beer bars, but opens onto a back patio that is perfect for sunny California days. There are fifteen taps at the front bar, and ten more in a bigger room called The Back Bar -- an assortment of off-the-beaten track Belgian and Belgian-inspired beers, some nice California offerings, and some surprises from Mikkeller and Evil Twin, including an Evil Twin coffee porter specially brewed for The Trappist. The food is reasonably-priced and not too fancy, and there is a good assortment of special bottled beers if you need to show off. 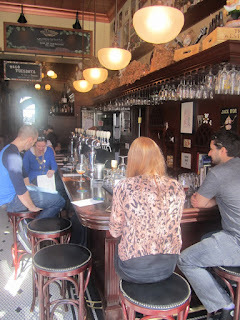 Compared to the similarly-named and -themed La Trappe across the bay in North Beach, there are more taps here, though La Trappe seems to have a longer bottle list. Both are fine establishments, but The Trappist is less crowded, less expensive, and seems a little more laidback than its counterpart in the City. A few blocks toward the bay from The Trappist is the new beer-geek darling of Oakland: Beer Revolution. It's easy to see why people are so enamored of Beer Revolution: over 40 taps of well-chosen beer, plus several coolers full of bottles for takeaway or drinking there ($1 corkage fee), and the easy-going taproom/bottleshop system of bringing in your own food. It's like a less crowded, less expensive, more laidback version of SF's City Beer Store (a theme is developing here). There's even a small but sunny patio area out front. I had a great time at Beer Revolution, enjoyed a delicious glass of barrel-aged stout from Drake's before wading in to the LA brewery tap takeover that was going on that weekend. One big gripe about Beer Revolution: the pint glasses there are cheater pints, those big-booted bastardizations that only hold about 13 ounces of beer. It wasn't just one that slipped into the mix -- after I noticed that I was served one, I started watching and all the pint glasses that came across the bar were cheaters. C'mon guys, it's the year 2012, please get with the Honest Pint program. 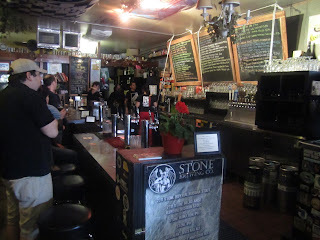 Now that I've gotten that off my chest, I'll still say that the selection and atmosphere make Beer Rev a must-stop in Oakland despite the glassware, and many of the big beers they'll tempt you with will be in smaller glasses anyway. 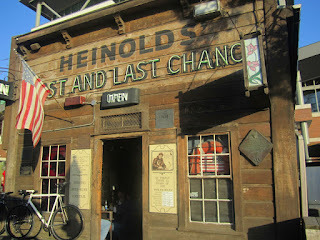 On the advice of Beer Revolution's co-owner Rebecca, I went from there right down to the waterfront to check out Heinhold's First and Last Chance. Something of a tourist trap which claims an association to Call of the Wild author Jack London, it is nevertheless worth a visit. They have a couple of sessionable local beers on tap, and they also serve -- another hat tip to Rebecca -- a very nutritious and delicious Bloody Mary. The floor and bar slope noticeably downward towards the back of the building -- a little remodeling done by the 1906 San Francisco earthquake. Heinhold's cleverly straddles the line between cheesy and authentic, and it would be better to say you'd been there than to say you'd missed it. There are a couple of breweries in downtown Oakland: Linden Street Brewery, which I didn't get around to visiting but which had some tasty beers on tap at Heinhold's; and Pacific Coast Brewing around the corner from the Trappist, which is friendly and comfortable enough but doesn't make very good beer (luckily they have about a dozen guest taps). If you're looking for a good meal with good beer to accompany it, head up Broadway away from the bay to Luka's Taproom. The 16-tap beer list won't blow you away, but it's serviceable enough, and it's fun to watch the hip locals come and go while you fill up on good food. Oakland has a lot going on beer-wise, and offers easy access to San Francisco while being much cheaper, quieter, and easier to navigate. Next time you're headed to the Bay Area, consider setting up camp in Oakland. I am not a fan of cheater pints but I came across non-cheater 13oz pints standard all over in beer bars across the area. I think it is just a way to keep the beer price down in an expensive city. What is a "non-cheater 13 oz. pint"? Was it marked with a 13 oz. line? Or the menu listed it as 13 ounces? What places in the Bay Area did that? Neither was the case at Beer Revolution. I'm OK with smaller servings, I think the operative word is "honest", not "pint". But I haven't noticed the honest 13 ounces you mentioned. yes a non-cheater is listed as 13 or 14oz. I came across this at bars and breweries like 21A and Social Kitchen and City Beer Store. More places not coming to mind now.